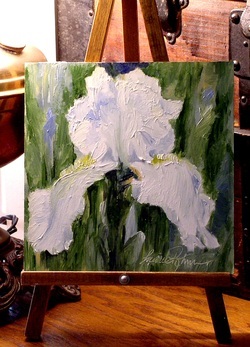 Pale Blue Iris Nature Art botanical garden flowers original oil painting by Laurie Rohner. 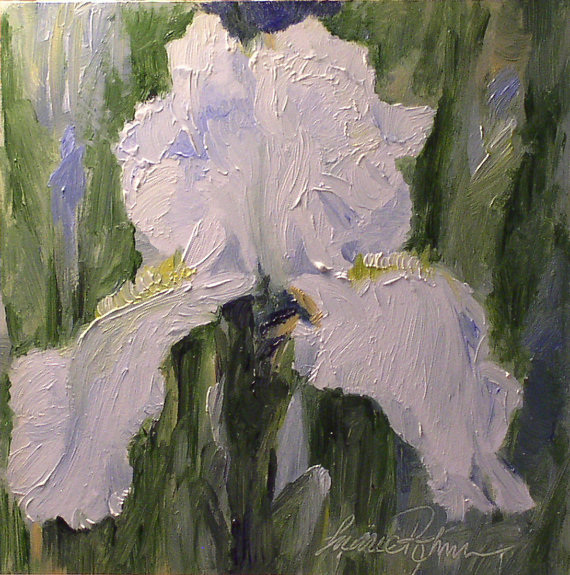 Botanical garden flowers is an original oil painting of a Pale Blue Iris by Laurie Rohner. The artwork is original and painted on a panel. The iris I painted here was almost white but had a blue hue about it. I love the feel you get from the wild bush strokes and the placement of color. Simple shabby chic artwork makes a nice addition for Farmhouse Cottages. The iris is probably my favorite of flowers due to their range of differences. The shapes and colors of the petals and how the shadows cast intricate designs absolutely fascinate my painterly senses.